Saturday night wouldn't a great Saturday night without a gig. 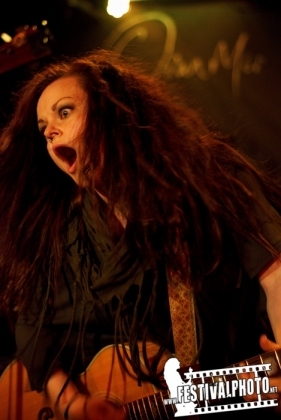 If the Katzenjammer girls are in town, you definitely can expect hell of a energy bursting gig. Just couple minutes to seven, people were already queuing outside the Oran Mor in Glasgow West End. The note on the club door inside said that the first to play Gabby Young and shortly after her the Katzenjammer with hour and a half long set. Short but concentrated. Usually known as Gabby Young and Other Animals, this time prepared very stripped and very acoustic set indeed. Appearing only two persons on the stage – Gabby and her fiancée (the fact was mentioned out loud in between the songs) Stephen Ellis. That, of course did not make them any worse, rather more intimate to the audience. Gabby prepared short, six songs, set and with her quite expressive theatrical performance and Stephen's energy (which apparently was too harsh on the guitar chords, as one of them refused to participate) time simply flew away. 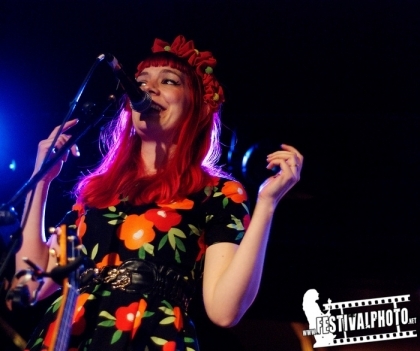 By the reaction of the audience, jazzy Gabby Young was pretty much the best supporting act for Katzenjammer. It was planned that after half an hour break, the Katzenjammer girls will start their show. As hard to believe it, they started even earlier! As they got onto the stage, it was already clear – even if there were anyone sitting, pondering in the club corner, there is no way someone keep continue that when these wild Norwegian lasses are on the stage! It's been about four years, when I have seen them live last time in Oslo and so many things are different: the place, how well known they became since then, the music but one things is for sure – they are as wild as ever. Every each of them are so different: Marianne Sveen – unpredictable and devilish, sweet Solveig Heilo, a little reserved but still essential member - Anne Marit Bergheim and of course very dynamic and energetic Turid Jørgensen. Katzenjammer played a great mixture of new and old songs, however, older songs were welcomed more by the audience, in particular - “Bar In Amsterdam” and “Hey Ho, On The Devil's Back”. Of course, there is no surprise, as these songs are probably the most popular ones so far. Girls were absolute energy balls: exchanging the instruments among themselves, talking and sharing stories in between the songs, laughing and making people laugh – they gave everything they've got to the fans, dancing in front of the stage. Lasses played a set of 17 songs and came back for the encore for two more tracks to keep their fans happy.